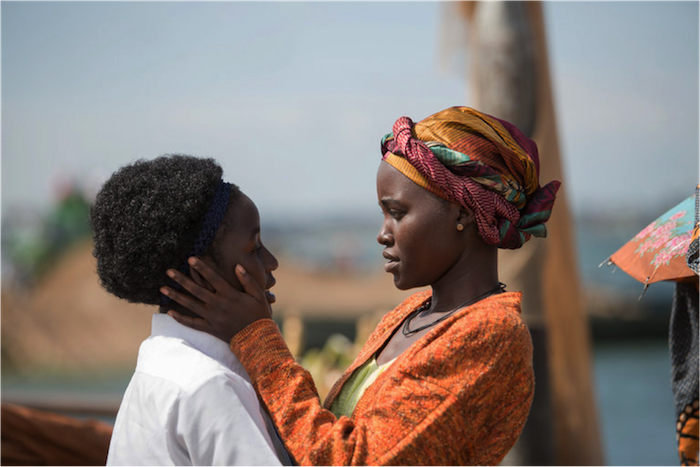 Madina Nalwanga, left, and Lupita Nyong’o star in “The Queen of Katwe,” a film from Walt Disney Studios directed by Mira Nair. Photo Credit Edward Echwalu/Disney Enterprises Inc.
LOS ANGELES — Just last week, Margot Lee Shetterly finished the manuscript for “Hidden Figures,” her nonfiction book about black women who worked as mathematicians for the United States rocket program during the Cold War era. The film adaptation? It started shooting over a month ago in Atlanta, with Taraji P. Henson in a lead role. Chernin Entertainment, the company behind the movie, is already anticipating a year-end release to qualify for Oscar consideration. Without a doubt, a castigated Hollywood is in a hurry to find what was largely missing during its last two awards seasons: diverse prize contenders. More than a dozen pictures with black issues, actors and, often, filmmakers are poised to surface once the summertime superheroes have their moment, with many of these diversity-minded films pointed toward the Academy Awards. Several movies — including Paramount’s “Fences” and Disney’s “The Queen of Katwe” — are being assembled by major studios. Others, like the slave revolt drama “The Birth of a Nation” and “Southside With You,” about a young Barack and Michelle Obama, were snapped up at the last Sundance Film Festival. The push comes in the wake of the #OscarsSoWhite outcry that humiliated the Academy of Motion Picture Arts and Sciences after its acting branch put forward an all-white field of nominees for the second consecutive year, and of subsequent casting controversies. It is a chance for Hollywood to show a strong slate of movies made by black filmmakers, as it did in 2013, with the release of “Lee Daniels’ The Butler”; the Gugu-Mbatha Raw vehicle “Belle”; and “12 Years a Slave,” which won the best picture Oscar. Fox Searchlight, which powered “12 Years a Slave” to that victory, bought “The Birth of a Nation” at Sundance in a six-studio bidding war. 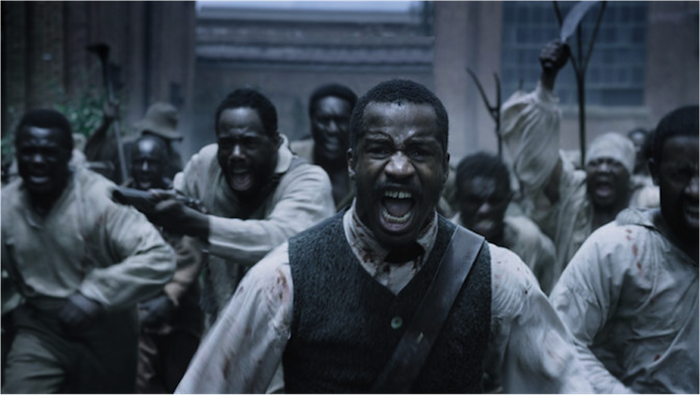 Fox Searchlight’s strong track record at the Academy Awards, as well as a sense that there could be a correction of sorts following the last two awards cycles, has already prompted prognosticators to pronounce “The Birth of a Nation,” directed by and starring Nate Parker, as this year’s film to beat. While early front-runners often falter — “The Revenant” was once the leader for this year’s Oscars, but “Spotlight” ultimately won best picture — Mr. Parker’s film is expected to capture attention with a bold marketing campaign that may well stretch beyond the confines of Hollywood, to trade on the energy, and potentially the outrage, brought on by an already unpredictable presidential election. Fox Searchlight has scheduled an Oct. 7 release date. Other black-themed films are likely to be vying for awards votes, too. On Nov. 4, Focus Features, an art house rival to Fox Searchlight, will release the period drama “Loving,” about the interracial couple (played by Ruth Negga and Joel Edgerton) whose arrest for marrying in 1958 and subsequent legal battle led to the end of America’s anti-miscegenation laws. Directed by Jeff Nichols, “Loving” will play in competition at this month’s Cannes Film Festival. Paramount, which pushed Ava DuVernay’s “Selma,” released in 2014, for the Oscars, has high hopes for “Fences,” an adaptation of August Wilson’s Pulitzer Prize- and Tony Award-winning play about the black experience in the 1950s. Denzel Washington, a two-time Oscar winner for his roles in “Training Day” and “Glory,” is directing “Fences” and playing a lead role. Mr. Washington won a Tony in 2010 for his performance in a Broadway revival of the play. Walt Disney Studios — which recently drew criticism for casting Tilda Swinton as a hitherto Tibetan character in “Doctor Strange,” from its Marvel unit — may well join this year’s awards conversation with “Queen of Katwe.” Directed by Mira Nair, an Indian, “Queen of Katwe” is based on the true story of Phiona Mutesi, a Ugandan chess champion. It features Lupita Nyong’o, an Oscar winner for “12 Years a Slave,” and David Oyelowo, who played the Rev. Dr. Martin Luther King Jr. in “Selma” but was overlooked by the academy, in prominent roles. Disney plans a Sept. 23 release. In late August, Miramax will join Roadside Attractions to release the love story “Southside With You,” which recounts the Obamas’ first date. Around that time, A24, represented at this year’s Oscars by “Room” and the documentary “Amy,” is likely to roll out the hip-hop-infused “Morris From America,” a coming-of-age comedic drama starring Craig Robinson and Markees Christmas. A24 is also looking at an awards season release for “Moonlight,” a 1980s-era drama based on the play “In Moonlight Black Boys Look Blue.” The movie, directed and written by Barry Jenkins, has production support from Brad Pitt’s Plan B Entertainment, known for “12 Years a Slave” and “The Big Short,” which scored five Oscar nominations and won one, for adapted screenplay. Black youth, and young black directors, may have their moment in Steven Caple Jr.’s “The Land,” a drama acquired by IFC about four impoverished friends in Cleveland, and in Mr. McMurray’s “Underground,” which counts the producer Reginald Hudlin (“Django Unchained”) as a member of its creative team. Mr. Hudlin is just now resuming his work as the director of “Marshall,” an independent film in which Chadwick Boseman plays a young Thurgood Marshall in a quest for racial justice that predated Marshall’s years on the Supreme Court. “We’d love to get it out this year, but it has to be right,” said Paula Wagner, a producer of the film. Mr. Hudlin, Ms. Wagner noted, had interrupted work on the film to help produce this year’s Oscar ceremony. If “Marshall” indeed makes it to the screen soon, with its story of a black lawyer in a United States just emerging from its Jim Crow era, it will share the stage with “Hidden Figures,” a tale of black women using math to rise in the same, often difficult milieu. Theodore Melfi (“St. Vincent”) directed the adaptation of Ms. Shetterly’s book. “It’s been such a whirlwind,” said Ms. Shetterly, who described her forthcoming book’s part in the sudden eruption of the kind of films that only months ago were said to be on Hollywood’s endangered list.